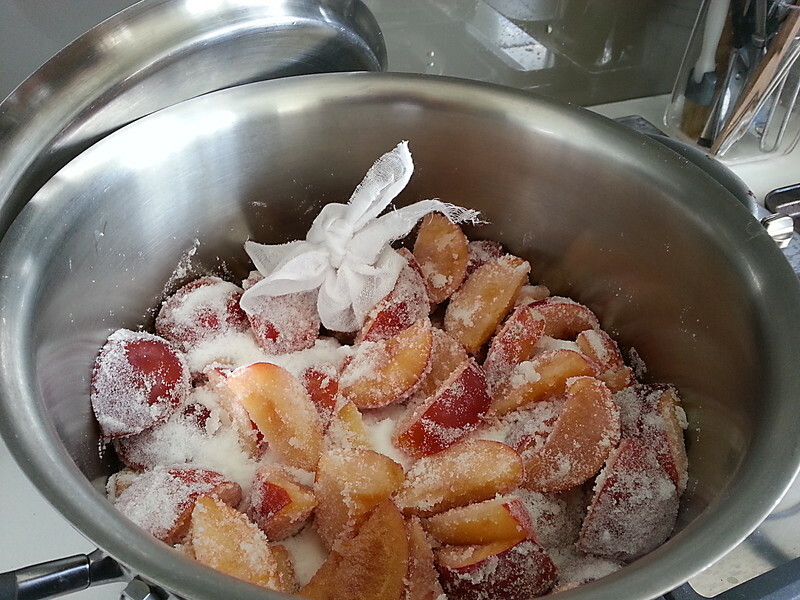 Coat plums in sugar and leave covered overnight along with a muslin bag with some of the plum kernels in it. I used Stephanie Alexander’s ratio of fruit to sugar. 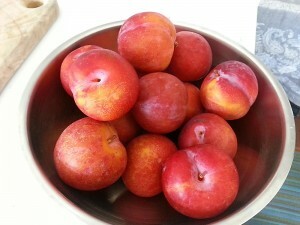 She uses 2kg plums, 1.25kg white sugar and 2 tablespoons lemon juice. Cut up plums, and set seeds to the side. Whack 10 of the seeds to crack them and place the kernels inside in a muslin bag. Place fruit and sugar in a large saucepan with a lid and leave overnight. The next day bring to the boil and skim froth. Add lemon juice and simmer for 30 minutes or until a teaspoon of jam sets on a cold saucer you’ve had sitting in the freezer. 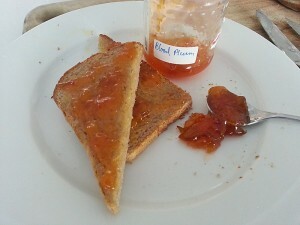 Remove jam from heat. Put muslin bag in a strainer over saucepan of jam and press with a large spoon to extract liquid. Ladle into hot, sterilised jars and seal. N.B. 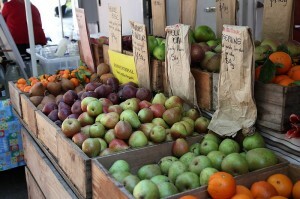 The key to success is to use fresh fruit from the market, mostly ripe for good flavour and some still quite firm and tart. 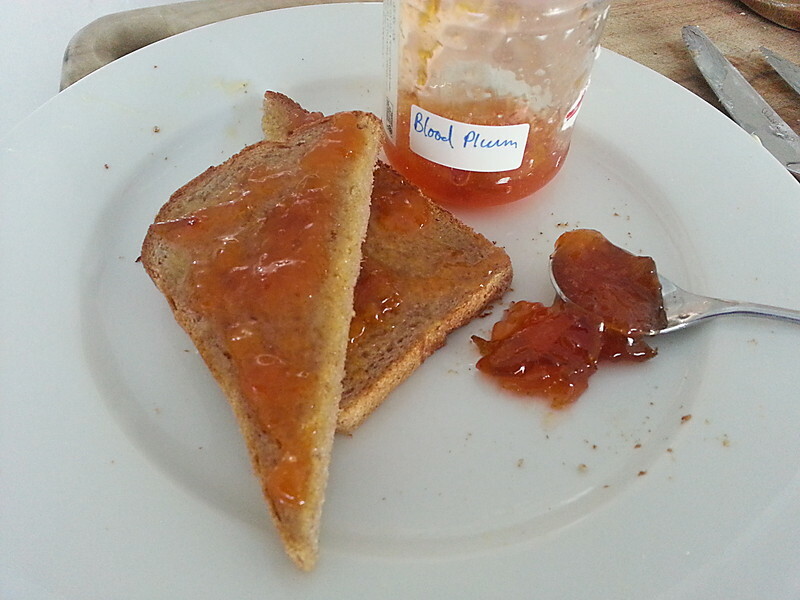 The under-ripe fruit has higher pectin levels which is what gives the jam its setting-ability. The kernels also add a lovely almond background flavour. Next pick up Sicilian olives and hummus for casual pizza dinner with friends, salami and soft French white mould cheese, a small Tuscan kale seedling for never ending batches of minestrone made with veal stock and thick lardons of pancetta. If you get sick of walking around, a cup of chai while sitting on woven mats in the sunshine is pretty nice… you can also get a $10 haircut at the stall next door. I haven’t been brave enough to try. 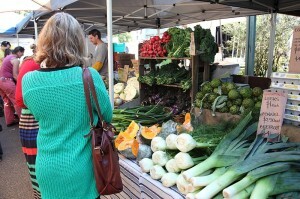 There are both conventional produce and organic stalls, the conventional ones are labelled as such. The advantage of having both is sometimes the organic range is limited and if you have your heart set on cooking a certain something you’re more likely to find it having both options. The Common Ground bakery always smells good and they have a super juice with more good things in it than you could could think of. They usually sample it so you can try before you buy. 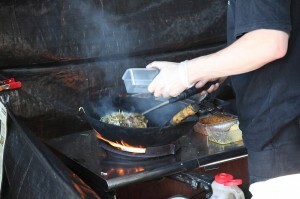 They have lots of options for gluten and wheat free eaters. I bought a rice flour banana bread for my sister which she said was great. The also have spelt, rye, wholemeal, with and without nuts and seeds and all slow fermented sourdough (read maximum flavour development). 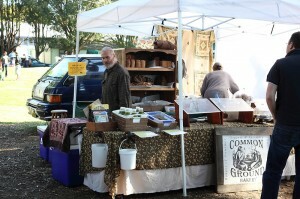 They deal directly with a wheat grower too so their flour is really fresh. I just liked all the info they passed on, it shows how passionate they are about their product. They also had a rice flour lamington, the first of it’s kind I’ve come across, haven’t tried it yet though. There’s also a Brasserie Bread stall where they try to lure you with delicious brownies and danish pastries. I’m sold on the sour cherry loaf and the quinoa and soy seed loaf if you like seeds. There is also a German bread stall with darker rye loaves, pretzels and tiny chocolate chip buns. I think the chocolate buns are best served toasted with butter, but they’re also good straight from the bag while browsing. Shopping just about done (and cash nearly depleted) and I settle on nasi lemak and otak otak, D has a lamb wrap from another stall which is a more appropriate portion size than mine, which is enough for two hungry people, so we take the rest home for lunch. 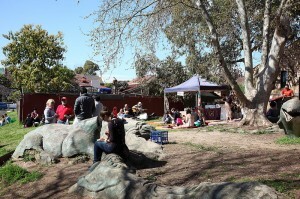 I bought some coffee beans from the fair trade stall and had a delicious coffee at home made from PNG beans. Flavoursome and strong without being too acidic or bitter. I’ll try and get a picture of the corn fritters next time, they’re my healthy option for when I’ve had an indulgent Saturday night! 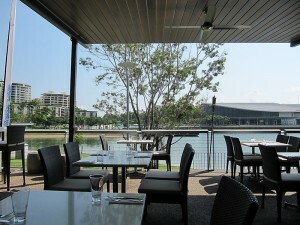 The view from Il Lido, Darwin, down at the waterfront. 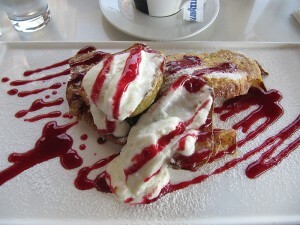 The French toast with poached pear, raspberry sauce and King Island yoghurt. I would also recommend the PLT, thin crispy pancetta, lettuce and tomato on a toasted panini with a housemade aoili. You are currently browsing the archives for the Breakfast category. Entries (RSS) and Comments (RSS). 41 queries. 0.260 seconds.